The recently wrapped Democratic National Convention easily topped the Republican National Convention in total viewers every single night during national broadcast hours. The DNC ended with 26.2 million, 25.1, and 35.7 million viewers for September 4th, 5th, and 6th respectively. Tuesday’s audience was a 15% improvement over 2008, Wednesday’s fell 3.1%, and Friday’s audience was only 6.9% short. 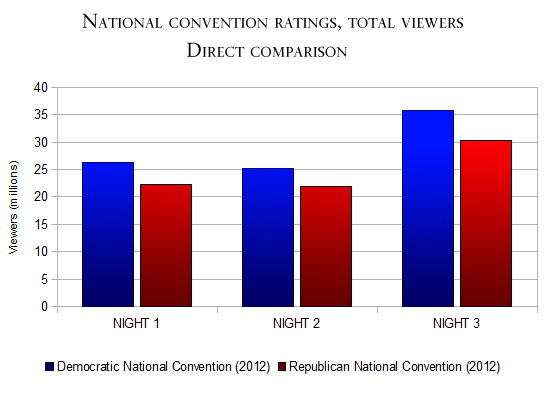 The Republican National Convention about par for the firs two nights and dropped significantly in the finale. Numbers for the first night of coverage aren’t available due to split coverage of Hurricane Isaac. The convention ended with audiences of 22.3 million, 21.9, and 30.2 million for nights two, three, and four. That’s a 3.4% gain over 2008 for night two, and an 18.7% fall for the finale. It was speculated that ratings for the DNC would also see a significant fall from 2008, simply because that’s what happened for the RNC. But that’s not the case. The drop-off for the RNC was much worse. * President Barack Obama drew 35.7 million viewers. * Mitt Romney drew 30.2 million viewers. * Former President Bill Clinton drew 20.6 million viewers, impressively beating (barely) the first regular season NFL game of the year (20.1m). * Paul Ryan drew about 20 million viewers. * Ann Romney drew 22.3 million viewers. * Michelle Obama drew 26.2 million viewers. * Contrary to reports from stupid TV news actors, “Here Comes Honey Boo Boo” didn’t beat the RNC in the most meaningful metric for a political convention: total viewers. All reports are hyping the 18-49 demographic, the most valuable to advertisers, which has no context during political conventions because they have no commercials. The fourth episode of “Boo Boo” may have lead the RNC with 2.9 million viewers in the 18-49 demo, but the RNC crushed its competition with 22.3 million total viewers for the evening. This “story” was nothing but an attempt by TV industry websites to try to steal traffic by posting convention-related stories. The DNC averaged 28,694,000 viewers across the convention, while the RNC averaged 24,831,000, excluding the night we don’t have information for.